We recommend that all clients start by filling out the form on our Request a Home Inspection page, the link is on the right under "Client Tools". This will give us an idea of the general timeframe you're considering. After the form has been sent, we will contact you via email confirming your inspection day, time and price. 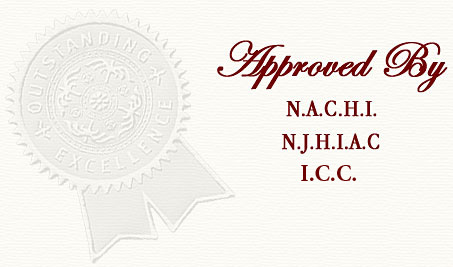 A Pre-Inspection Agreement (required by the State of New Jersey) will be included with your confirmation. This industry standard document describes the scope of the home inspection, what is inspected and what is not inspected as well as the fee for services rendered. One common feature that all homes Interspec, LLC inspects is this: No home is perfect! Whether a one hundred year old Victorian home in historic Cape May to a modern Longport beach house, all homes suffer from some types of maintenance or installation issues. New homes are not immune. Many of the problems found in older homes are also found in newer homes as well. Although modern building standards have evolved to include even the most specialized aspects of building, the fact remains that human error will always play apart in the construction industry. Installation issues have and will continue to be a factor in homebuilding. For home buyers: An inspection is vital to uncovering issues a home may have but are invisible to the untrained eye. An inspection will give you the opportunity to ask the seller to make the repairs before you buy, or to back out of the contract. Be sure to ask for an “inspection contingency” when you begin to enter negotiations with the seller. This allows you to set a limit on the cost of repairs to the home. It is a good way to protect yourself from ending up with a home that requires repairs that you are unable or unwilling to pay for. On the day of the inspection: It is recommended that you accompany the inspector on the inspection of the property. This is so you can become familiar with the home and its systems as well as what repairs the inspector recommends. You might also want to prepare a list of items that you’ve seen in the home that you feel are cause for concern as well as any questions you may have. For homeowners: It’s important to be aware of any issues your home may have prior to listing the property. Getting a Pre-Listing Inspection, such as those offered by Interspec, LLC will ensure that you’re aware of any problems and can take care of them on your terms – or present them as-is and adjust your selling price accordingly. The alternative leaves you open to costly repairs and delays, and even potential deal-breakers once you’ve entered negotiations with the buyer. Accessibility: As a home inspection is a visible evaluation of the property, we ask that all areas of the residence be made accessible. Special attention should be given to accessing the attic spaces and crawlspaces as these areas are important in evaluating the construction of the home. Maintenance: We recommend that all minor repairs (leaky faucets, missing/broken light bulbs et cetera) be repaired prior to the inspection. We will take many pictures of the property during our inspection, so the clearing of any cluttered areas will help ensure a smooth inspection.